The sugar shake process to detect external parasites of bees involves rolling bees in an icing sugar mix, then separating the mix and any dislodged nasties from the dusted bees. The bees stay in the container and the loose material is tipped through some mesh into a container of water or a flat white sheet of paper. Clearly the mesh needs to allow sugar with potential mites through but not bees. This is the same theory for screened bottom boards in hives. The wire spacing on a queen excluder is typically 4.5 to 5mm which allows worker bees to pass. Typically varroa are less than 1.5mm wide, so a mesh wire with aperture spacing of about 3 mm is suited. The common sugar shake kits provided to clubs by the DPI (sourced from Valley Industries) have a mesh aperture of about 3mm, with a wire diameter of about 0.5mm. First a suitable jar or container with a screw on lid needs to be found. The jars shown were only $2 each and could be purchased in either a 1 or 2 litre size. First, hunt down a suitable jar or container with a screw-on lid. The jars shown were only $2 each and either the 1- or 2-litre size would work well. It’s important to get jars with lids that screw on with multiple turns. When you’ve finished, the wire mesh will fit between the inside lid and the top of the jar. 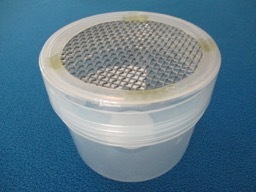 If the screw thread is very short, the lid will not screw completely home when the mesh is in place. 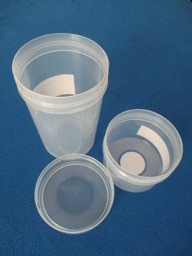 The photos show the long screw thread on these plastic containers. We sourced galvanised mesh with 8 wires per inch, 3mm aperture and 1 mm wire from the Locker Group at Prestons. The equivalent mesh in stainless steel was available at Wire Mesh Industries at West Ryde. Using the plastic jar neck as a template and a spirit marker to mark the circle on the mesh, cut the mesh with tin snips. This is not that easy with the 1mm wire but it can be done. Stainless steel would be harder to cut again and may require an angle grinder. The 8-wires-per-inch (3mm aperture, 1mm wire thickness) galvanised mesh was sourced from the Locker Group at Prestons. The advantage of using this heavier gauge mesh is that the remainder of the mesh sheet can be used to make open-mesh bee-box bases. The plastic container lid had a series of marked circles on it. Using an outer ring and, with a coping or fret saw, cut out the central part of the lid. A sharp knife can be used to trim up the hole. The mesh was fitted and glued in place using two-part Araldite. Wait for the glue to set and the job is done. Wait for the glue to set and the job is done. Older PostWhat will a sugar shake test detect?